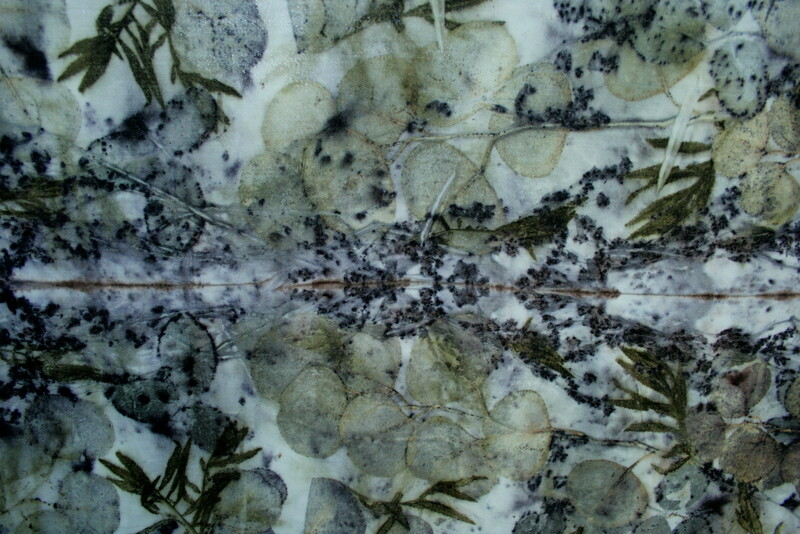 I put a couple of more things up on etsy today…..
I’m really happy with the eco print scarves and the piece of eco printed wool that I listed. Not as happy with the shawl. Don’t get me wrong…… it has a wonderful ‘hand’, and is so soft and cuddly! But the colors are a bit mousy. I need to dye some more yarns in deeper more saturated colors. In the meantime, after I weave off the scarf that is on my loom, I might weave something out of my left over stash of aniline dyed cottons to get a color fix. The thought of taking photos and editing them, and writing words…… in the re-opening of my etsy shop….. leaves me cold! I am just not feeling enthused. I do know that I enjoy creating….. I do not enjoy marketing. Here are photos of the first five things I’m going to list…. 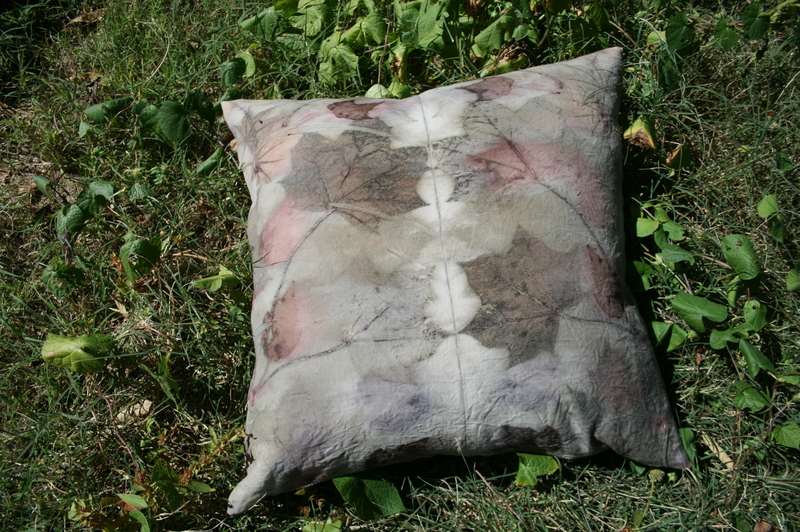 I made a pillow from one of the pieces of ocean dipped wool for John….. Not many would roll their pant-legs up and walk into a frigid ocean to help their ex-wife to soak fabric. And he did it without hesitation! Always encouraging….. one of the reasons that his children turned out so splendidly! Now…. 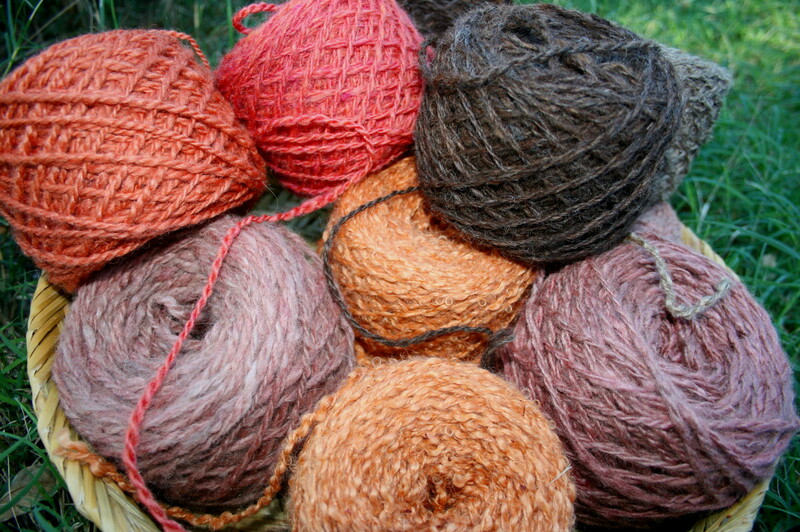 to take these naturally dyed yarns and wind them into a warp for a shawl. I’m planning on re-opening my etsy shop this coming Monday. 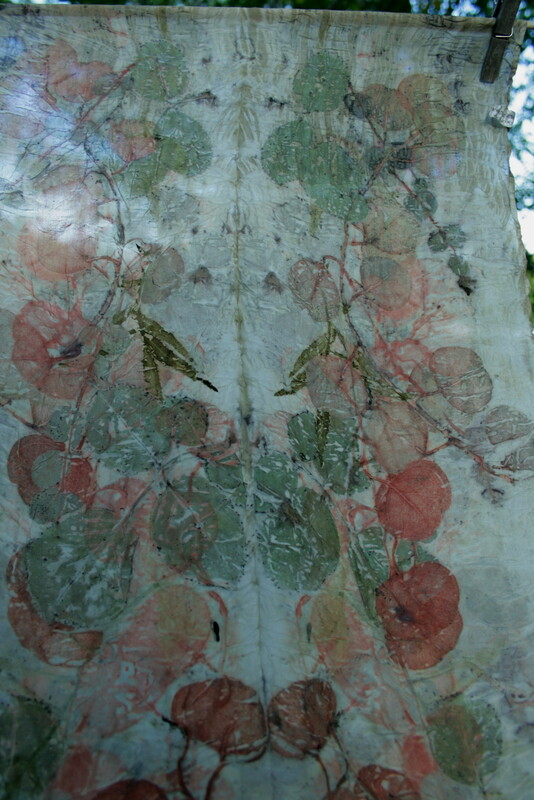 There will only be a couple of shawls and a handful of eco print scarves…. but it’s a start! My etsy shop was supposed to reopen this month, with lots of wonderful new handwovens…… but we all know that I have been doing no weaving. 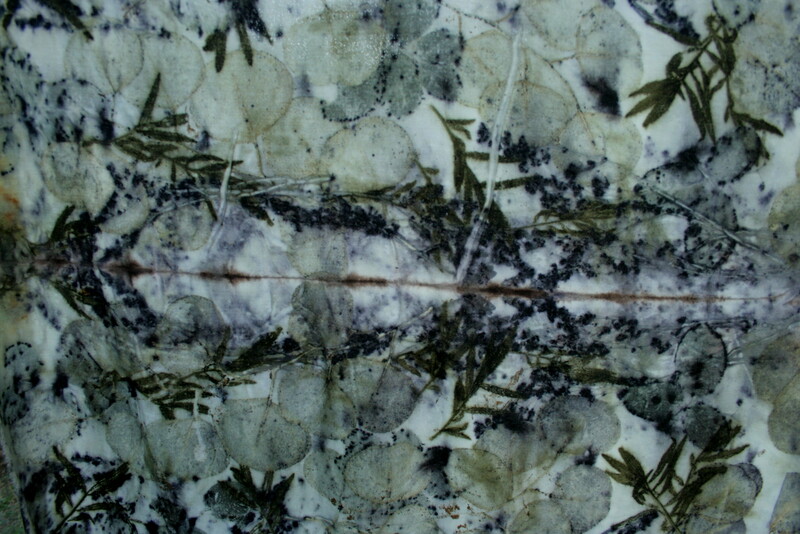 I thought that maybe I would get some eco printed things into it instead. 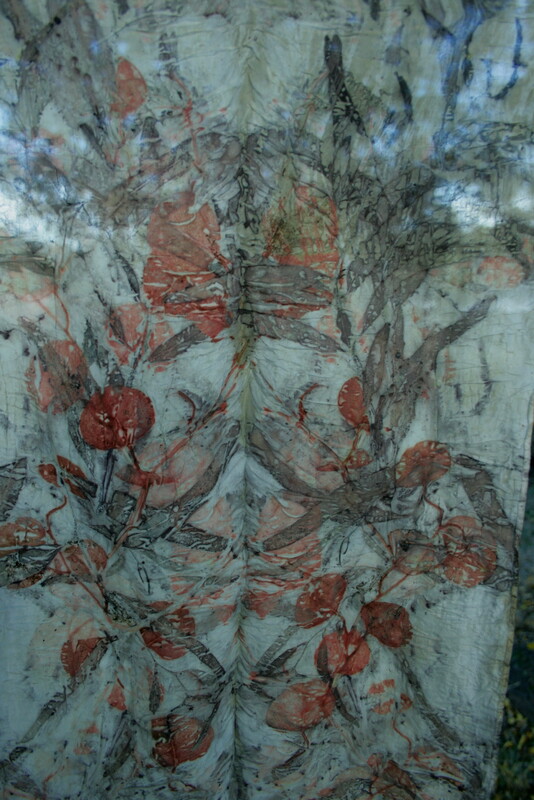 So I have been busy this weekend making eco printed scarves….. 12 in all. Some I really like, others not as much so will work on them more. 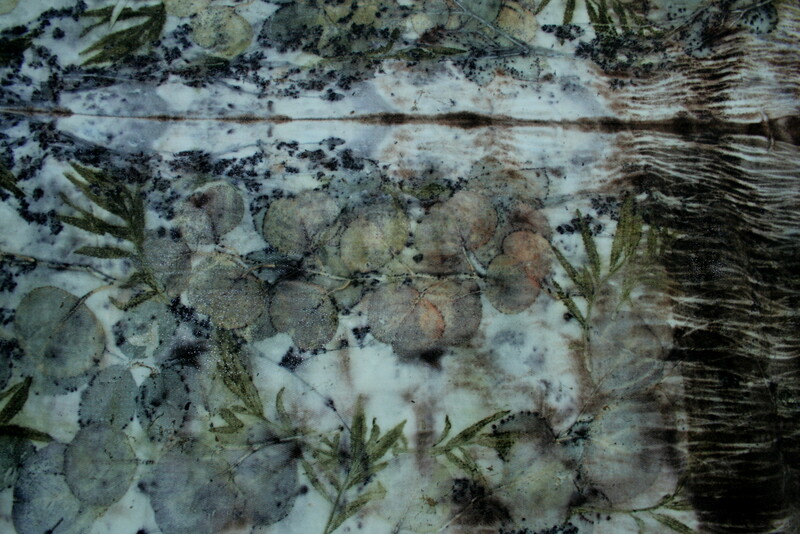 Here are photos of two of them….. will post photos of all twelve next week, after they are washed. 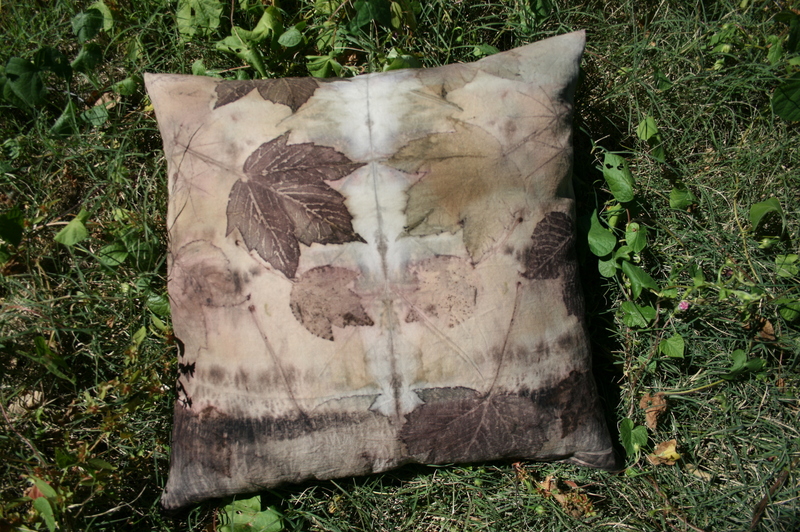 I also worked on my last piece of sea soaked wool….. it might become pillows, or perhaps I’ll sell it as fabric. I really shouldn’t be doing any of this yet. Apparently I dislocated my elbow last week when I was at the ocean holding a bag of wet fabric….. I had felt a ‘pop’ and then my hand went tingly for awhile. Then it seemed fine. But it was hurting at work last weekend, and when I went in to the chiropractor on Monday she informed me that my elbow was dislocated . Sigh…. I have about as much patience for healing as I do for waiting for bundles to age!